I was planning to move on from RDK, but since I boobed last time around (RCP XIV: Pretty Good Year), I thought I should do one more that most definitely is an ISE. 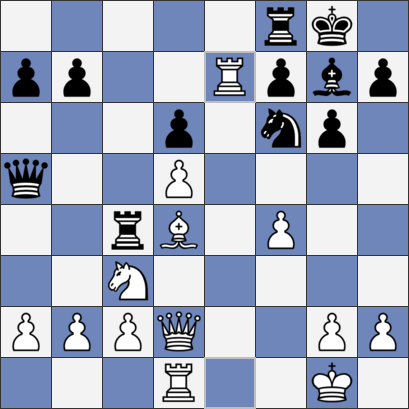 So, Black’s just gone … Qa6-a7. Ray to play. "I spent half an hour considering this sacrifice … ", our man writes in Flank Openings (his notes to the game are also available for free here), "a primarily strategic offer based on the weakness of Black's pawns and the isolated position of his queen." Half an hour well spent, it turns out. The "!?" Keene appends to his move suggests he wasn’t 100% sure about it, but today with the benefit of computer engines we can be a little more certain. Ray’s judgement was spot on. I might not have scored a floating chessboard for my birthday last week, but I did at least get a couple of chess books. 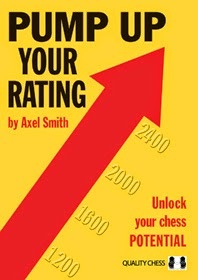 One of them being Axel Smith’s highly regarded Pump Up Your Rating. The first question on picking up a book with a title like PUYR is simply this: why? A BORP? decision for me here. How to recapture on c5? 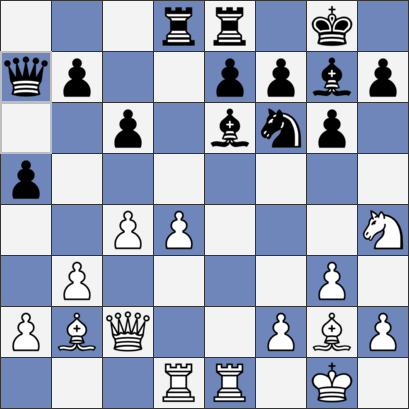 Take with the rook then try to swap the a and b pawns to play against c6 or take with the b-pawn and play against b7? Both options seemed plausible to me at first glance. Fortunately I had some help when making the decision. When thinking about my move I remembered the Larsen-Donner Master Game rook ending (SMA#21) and realised that taking with the pawn would give me a similar queenside pawn configuration. I also recalled Keith Arkell’s minority attack rook and pawn position from the British Championships when he won by opening the king’s wing and attacking Black from the side. Best of all there is a detailed chapter on minority attack endgames in Hawkins’ From Amateur to IM, a book I’d bought a year or so ago. Back in July the Blog reported, in the post History Boy, Paul McKeown's splendidly erudite and entertaining presentation (at the City Lit in London) about an episode of chess in days of yore. Now there's another effort coming along, though Paul's will be a hard act to follow: this time it will be your blogger talking to the excellent Streatham Society about "Militant Activity: Chess in Victorian Streatham, and Beyond" on Monday 6th October. It was my birthday on Wednesday. Did anybody buy me a floating chessboard? No they didn’t. That's just about right, even at this distance. Nigel's having himself a bit of whinge. 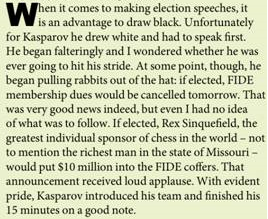 Nigel Short, New In Chess 2014#6, page 39. Well, I'll take the Cynicism Challenge and see how cynical I can be. Cynically, I wonder. If you were the candidate in a presidential election and your main backer was promising ten million dollars to spend if you won - no strings, no questions asked - would you actually wait until half an hour before the election to announce it? 1974: A pretty good year for Ray and ISEs. We’ve already had his effort against Cardoso from the Olympiad in Nice (RCP XII) and a brace from Cuba (RCP XI; RCP XIII). Here’s a third from Camaguey. We join the game with Black having played ... Rbc8. Of course this allows Ba6 'winning' one of the rooks for his bishop. It’s the way I blunder material all the time, but RDK, needless to say, had a plan. Interesting that even with the dark-squared bishops off the board he was still looking for ways to give up a rook for a minor piece. 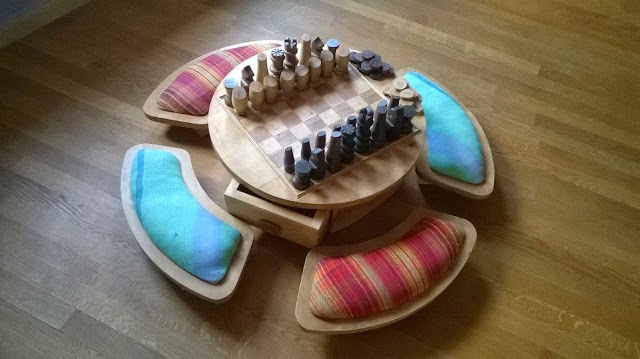 Would you like to own this chess and draughts set table-and-chairs ensemble? Is it even called an ensemble? Why am I asking you this? The second edition of the Streatham Library Rapidplay, run by Streatham and Brixton Chess Club, will take place on Saturday 20th September. Round one will start at 10.30am. All details on the SLR website here. - You can now enter online and pay through PayPal: go to the How to Enter page. - Entry fees are a little higher to cover costs, but will still be good value. - Prizes have been increased. - The Open section will use digital clocks: time limit 25 minutes with five-second increments. - The round times have been adjusted to give 45 minutes for lunch so you can get to any one of Streatham's excellent eateries, including a recently shortlisted pizzeria, and our favourite coffee shop. "How did you win that one?" In truth you can't win this kind of ending can you? Although you can help your opponent to lose them. 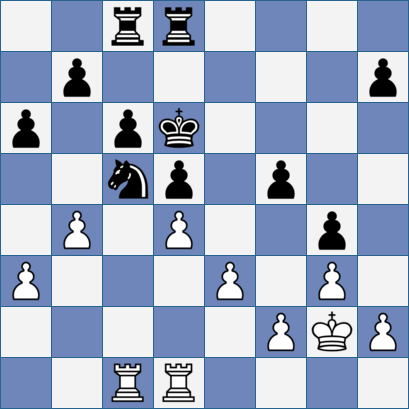 Especially if they are down to 1 minute plus increments, as was the case for the young fellow playing White here. Here we go again. 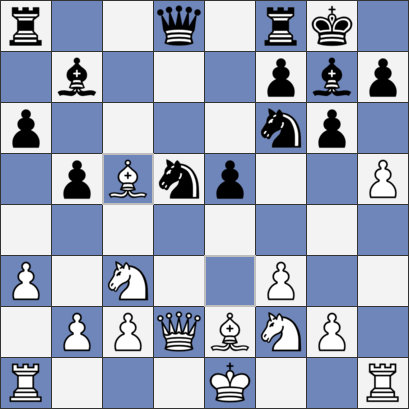 We’re back to 1974 again - see last week’s RCP XII - White has just played 18 Rxe7 and RDK is about to do another ISE. Just like Caro-Keene - RCP XI - this happened at a tournament in Cuba. Unlike Caro-Keene, though, this ISE actually happened. If that doesn’t require a Happy Dance, I don’t know what does. It's possible that on reading yesterday's piece your reaction was something along the lines of "look, this is all very deplorable but it was thirty years ago - surely everybody has skeletons to hide if we go back long enough?" Well yes, of course. I'm sure we all do. (Though if you don't want your errors from way back when to be taken into consideration, you shouldn't be invoking the Eighties in your candidate statement, should you?) However, this isn't so much a question of what happened thirty years ago as what has happened over a thirty-year period, running up to today. Keene and Lawson's cut-and-paste book, complete with Lawson's racist stereotyping, was thirty years ago, for sure. But it was rather less than that when Lawson decided a good man to work with would be a man accused of defrauding British chessplayers. It was rather less than that when he ran Nigel Short's obnoxious obituary. And it was just this summer when he wrote his vicious piece in the Mail and complained in the Sunday Times that teenage girls were dressing like harlots. Moreover, there's another way to look at it, which is that Dominic Lawson has had a long, long time - thirty years and more - to recognise who is a villain in English chess. Yet the obvious has apparently eluded him. Yesterday we were discussing, in passing, Dominic Lawson's time working with Ray Keene, not least as his editor at the Spectator, which periodical Lawson edited from 1990 to 1995. Now Ray has, of course, been exposed over the past year as a gigantic plagiarist, a matter which one might expect to concern anybody who was a professional journalist, like for instance Dominic Lawson. But as this blog has often documented, Ray's habit of stealing other people's work and passing it off as his own is merely an outgrowth of a much older habit - the practive of reusing his own work, in different places (or even the same place) and passing it off as new. Having established to his own satisfaction, over many years, that he could get away with that, it was just a short Penguin-step to the industrial-scale plagiarism of the past few years. One would expect the recycling habit to concern professional journalists too, what with the issues it raises of copyright theft, cheating the reader, journalistic integrity and so on. without the unsuspecting buyer being informed that the material they were buying had already appeared elsewhere. Unless I am much mistaken, the most notorious obituary in chess history was published in the Sunday Telegraph when Dominic Lawson was its editor. 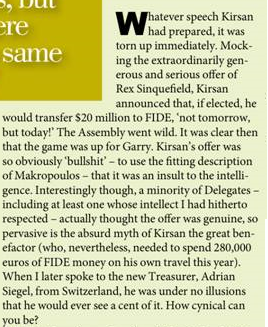 For some reason the editor chose not to red-pencil the most objectionable passage, though Nigel is often fortunate with his editors in that respect. As promised yesterday, here's Dominic Lawson showing who else he's prepared to insult. If you insert the term "inscrutable Asiatic countenance" in Google, you only get a couple of results. One likes to think that this is because few people would use such a horrendously racist stereotype. Exactly what you'd want from somebody invited to lead a multiracial community, don't you think? More Lawson tomorrow. In the mean time, we might add to the list of constituencies of whom Lawson is liable to speak objectionably, feminists. It's going to be an inclusive kind of Presidency, isn't it? EDIT: Just this evening I came across this remarkable commentary. Do we really, in 2014, want our president to talk about girls dressing as if they "were on the game", or to use phrases like "debauched as her demeanour seems intended to demonstrate"? At my last football match, I noticed that all the fans had the complexion and the body-scent of a cheese and onion crisp, and the eyes of pitbulls. ...the truth — that "pitbull eyes" are few and far between, and often hidden behind specs, and that the stands are full of actors and publicity girls and teachers and accountants and doctors and nurses, as well as salt-of-the-earth working-class men in caps and loud-mouthed thugs. Professional football in this country is the debased summit of a debased culture. Last week, a nasty and ignorant article appeared in the Daily Mail. This, in itself, may not constitute a novelty. However, the target on that particular day wasn't immigrants, or poor people, or any of the Mail's usual shooting-gallery. It was football. The people who play it, the people who watch it, the people who like it. It's been a long time since I read anything so unpleasant on that particular topic - not since the 1991 Martin Amis hate piece referenced above, in fact. Tromso may be over - The Best of Times; The Worst of Times - but that doesn’t mean we have to stop thinking about Olympiads. Times have changed. 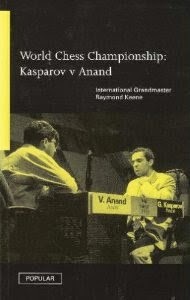 Incredible to think that forty years ago we - England - didn’t have any Grandmasters. We didn’t even have any Grandmaster norms until You Know Who notched one at Nice. Today’s ISE helped RDK on his way. 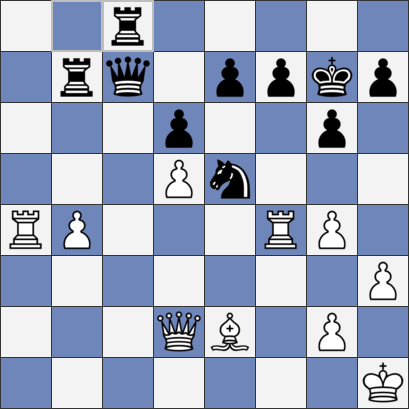 White has just played 16 Bc5 attacking the rook but Ray cares not a jot. 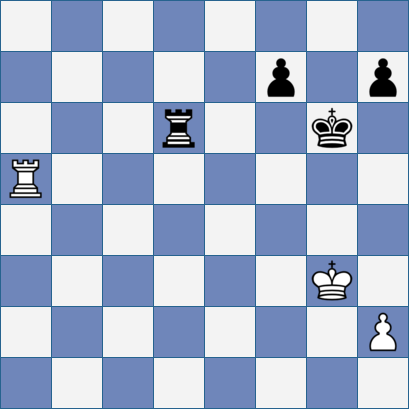 It took White a couple of moves, but eventually he bit. 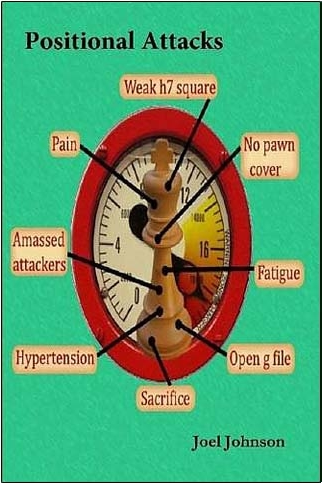 Keene didn’t go on to win this game, but eventually he got his norm and pretty soon afterwards, without dying, he was in the Daily Express (Chessman Raymond Plays for Cheque). Now that is what I call worthy of note.